Start your holiday trip to one of the magnificent city Kathmandu with the arrival at the Tribhuvan International Airport where one of our representatives will receive you and help you to settle down in the pre-booked hotel. Take some rest and then proceed to visit the most revered Hindu temple Pashupatinath located on the banks of Bagmati River. This temple complex is a UNESCO World Heritage site is a sprawling collection of temples, ashrams, images and inscriptions. After darshan return back to the hotel for dinner and overnight stay. 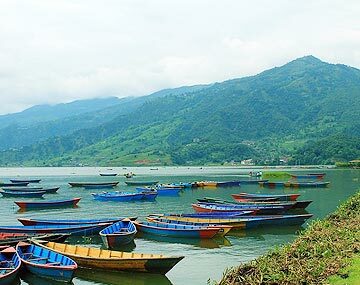 On the 2nd day of your kathmandu Pokhara tour package from Delhi after breakfast catch the flight to reach Pokhara. It is 30 minutes by flight from Kathmandu situated at the height of 2,352 feet above the sea level. Upon arrival, get the assistance from the representative to check into the pre-booked hotel. After some rest visit the Bindebasini Temple which is one of the oldest temples of Pokhara and was the part of Kaski Kingdom with the main deity of Goddess Durga. The temple is in the area of the bazaar and offers good views of Himalayan on a clear day. Also, visit Patale Chango an awesome waterfall lying 2 Km southwest of Pokhara and Gupteshwor Cave which is popular for its natural limestone deposits. Return back to the hotel for dinner and overnight stay. Today morning post breakfast fly to Jomsom which is 157 Km from Pokhara. The aircraft is a Twin Otter or Donair with the seating capacity of 15-18 people at a time. Upon arrival, check into the pre-booked hotel and take some rest. Jomsom is a scenic village in the laps of mountains and the hotels here have all the basic amenities. After some rest visit the Muktinath Temple. To visit it guests have to walk for about 15-20 minutes over the Kali Gandaki River. After crossing the river take the jeep on sharing basis to reach the Muktinath Temple. The drive takes around 1.5 hours to reach the base of the temple. It is a sacred temple for both Hindus and Buddhists and it is believed that one should visit this temple after completing Chardham Yatra. Retune back to the hotel for dinner and overnight stay. On the 4th morning after breakfast fly back to Pokhara by taking a connecting flight and then to Kathmandu. Upon arrival get assistance and check into the pre-booked hotel. Enjoy rest of the day at leisure activities or exploring some other attractions of this vibrant city like Narayanhiti Palace Museum, Kopan Monastery, Royal Botanical Garden etc with dinner and overnight stay at the hotel. On the last day of your Kathmandu Valley Sightseeing tour, proceed to visit Patan which is also known as Lalitpur the third largest town in the valley renowned for its rich cultural heritage particularly its tradition of arts and crafts. Don’t miss a visit to Patan’s fair-trade shops from where you can buy superior handicraft goods then visit the Swayambhunath which is one of the most recognizable symbols in Nepal and then the Kumbeshwar Mahadev Temple. Later, on get transferred to the airport to board a flight for the return journey. Kathmandu the capital and the largest city of the mountainous nation Nepal is one of the major tourist hot spots situated 1400 meters above the sea level. Its jam-packed alleyways, medieval temples, abundance of natural beauty, delectable delicacies make it an intoxicating, amazing and exhausting place to visit. So book your Kathmandu Pokhara tour packages from Delhi and explore this magnificently beautiful city. If you want a break from your hectic day to day life and want to spend some time in the calm and serene surroundings in the lap of Mother Nature then Nepal is a perfect destination for you. BookOtrip is one of the renowned international travel management companies that offer you amazing deals on hotels, flights, insurance, packages and car rentals for your smooth journeys across the world. Transportation Jomsom to Muktinath to Jomsom by a non A/c Jeep on SIC basis (12 pax in a jeep). Clients can take an independent jeep at an extra cost. Do ask for the cost. I love visiting the Temple and to see such beautiful monasteries was amazing !! Its a beautiful place !!! I am enough lucky to visit the holy land. The spirituality we get from there is something special. For all those who needs some refreshment in their life, i really suggest this package. Thanks bookotrip.